For information on the cast lineup as of September 2018, see Saturday Night Live (season 44). As of September 2018 [update] , the late-night live variety series Saturday Night Live (SNL) has featured 151 cast members. The ensemble was originally referred to as the "Not Ready For Prime Time Players." The list below includes both repertory and featured players past and present, but omits SNL writers and others who were not listed as cast members during the show's credits. The dates given are those of the years they were part of the cast. The chart also shows whether the cast member has served as a guest host, appeared as the anchorperson of the "Weekend Update" segment (by any of its titles), or has been the subject of their own "Best of" home video collection. Many of the cast members were writers as well. "Middle group" performers are introduced after the main cast by the announcer saying "...with" and reading off these performers before ending with featured players. Lighter colors denote "featured players" versus repertory cast members. These are the cast members who have spent at least 10 seasons on the show. Kenan Thompson 16 2003–present Thompson holds the record of being the longest-tenured cast member in the show's history. He was also the first cast member born after SNL's premiere in 1975 (Thompson was born in 1978) to have joined the show. 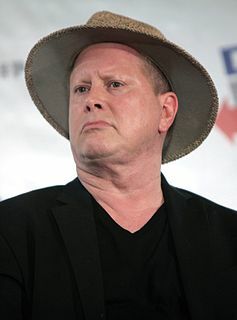 Darrell Hammond 14 1995–2009 Hired after a cast overhaul, he was the last cast member hired in the 1990s to leave the show, and the oldest cast member to leave the show (age 53 when he departed). In 2014, Hammond returned to the show as the announcer following the death of longtime announcer Don Pardo. Seth Meyers 13 2001–2014 Meyers anchored Weekend Update from 2006 to 2014, making him the longest-serving Weekend Update anchor (breaking the records held by Dennis Miller and Tina Fey). He left the show to become the host of Late Night . Fred Armisen 11 2002–2013 Armisen joined the show in season 28 and left at the end of season 38. Al Franken 1977– 1980; 1986; 1988–1995 Hired as a writer at the beginning of the series, as the show progressed, Franken and Tom Davis were allowed to perform material on-air sporadically. He left the show in 1980, but returned when Lorne Michaels came back in 1985, regaining his writing and on-air featured status until 1995. Despite the long tenure, he was only credited for about 90 episodes. Franken later served as a United States Senator from Minnesota from 2008 to 2018. Tim Meadows 10 1991–2000 Meadows joined the show in the second half of season 16, and left at the end of season 25 after ten seasons. At the time of his departure, he held the record for the longest consecutive tenure as a cast member. Laurie Metcalf 1 She also was hired as part of Ebersol's temporary season six cast following the termination of Jean Doumanian, and appeared on-camera in a Weekend Update piece. When the show was put on hiatus for retooling, she was not chosen to return to the show for the season seven cast. Dan Vitale 3 Hired as an on-and-off featured player for season 11, he was only credited with appearing in three episodes throughout the season. Morwenna Banks 4 She was hired as a repertory player for the last four episodes of season 20, but was let out of her contract as part of a major cast overhaul Lorne Michaels had planned for season 21. Ben Stiller 4 Before becoming a cast member, he submitted a short film – a parody of the film The Color of Money – that was shown on the season 12 episode hosted by Charlton Heston. He was hired during season 14, but quit after four episodes due to creative differences. Despite this, he returned to host in 1998 and 2011 and had a recurring role as Michael Cohen, Donald Trump's ex-lawyer. Fred Wolf 4 He's been a writer since 1992. However, he became a featured player in near the end season 21 for the last four episodes, however, he only appeared and was credited for episodes 17, 18, and 20. His last episode was in the 3rd episode of the 22nd season. After that episode, he decided to leave the show for good. Tom Schiller 7 One of the show writers who was upgraded to cast member status during season five, he left the show at the end of the season. Patrick Weathers 7 Hired as a featured cast member for season six, he was fired along with many of Doumanian's cast. George Coe 8 He was one of the original "Not-Ready-for-Primetime Players", because NBC wanted someone older in the cast. He was credited for only the first three episodes, though he continued to make several uncredited appearances throughout the first season. He was later known for voicing the valet Woodhouse in the animated series Archer . Yvonne Hudson 8 She was a recurring extra during season five, and became the first black female cast member in season six. Like many of Doumanian's cast, she was fired mid-season. Jim Downey 9 He was hired as one of many writers-turned-feature players in season five, and though he left the cast after the season, he returned to the show as a writer in the mid-1980s and has remained with it. Matthew Laurance 10 Hired as a feature player during season six, he was fired as part of the mid-season overhaul. Alan Zweibel 11 A writer for the show before joining the cast in season five, he left after the season finale. Gilbert Gottfried 12 He joined the cast for season six and was fired as part of the mid-season overhaul. Michael O'Donoghue 12 One of the original "Not Ready for Primetime Players" and the show's first head writer, he was dropped as a cast member after a few episodes. He remained with the show as a writer (leaving and returning twice) and occasional on-screen performer. Ann Risley 12 She joined the cast for season six and was fired as part of the mid-season overhaul. Charles Rocket 12 He joined the cast for season six and was fired as part of the mid-season overhaul, after having dropped an f-bomb one episode prior. Damon Wayans 12 Hired for season 11 as a featured player, he was fired mid-season for improvising on the air. He returned as a guest to perform stand-up comedy on season 11's last episode and hosted SNL in 1995. Beth Cahill 13 She joined the show during season 17 as an off-and-on featured player. She did not return the following season, as she was fired along with castmate Siobhan Fallon. Denny Dillon 13 She joined the cast for season six and was let go after the finale as part of the cast overhaul. She auditioned for the show's first season, but did not make the cut. Gail Matthius 13 She joined the cast for season six and was let go after the season ended. Paul Shaffer 13 After being the band's pianist for the first five seasons, he joined the cast during season five, but left after the finale. He hosted SNL in 1987, making him the only member of the house band to do so. Janeane Garofalo 14 She joined the cast during season 20, but quit mid-season due to creative differences. Michaela Watkins 15 She joined the show on the first episode after the 2008 United States presidential election, then was let go before the start of season 35. Peter Aykroyd 16 He joined the show midway through season five, but left at the end of the season, after only 16 episodes. After 14 seasons, Hammond left as the show's oldest active cast member, ending his tenure at 53 years during his final season in 2009. Darrell Hammond had the longest tenure portraying a U.S. president, with Bill Clinton from 1995–2001, and George W. Bush during 2003. Hammond also portrayed Richard Nixon in season 34, episode 12. There was also a sketch featuring Chris Farley, David Spade, Chris Elliott, Adam Sandler, and Tim Meadows auditioning for the role of Clinton. There was also a gag in a 2001 sketch with Tracy Morgan filling in for Will Ferrell as George W. Bush. Christopher Crosby Farley was an American actor and comedian. Farley was known for his loud, energetic comedic style, and was a member of Chicago's Second City Theatre and later a cast member of the NBC sketch comedy show Saturday Night Live between 1990 and 1995. He then went on to pursue a film career, starring in films such as Tommy Boy, Black Sheep and Beverly Hills Ninja. Farley died of a drug overdose at the age of 33. David Wayne Spade is an American actor, stand-up comedian, writer, and television personality. He rose to fame in the 1990s as a cast member on Saturday Night Live, then began a successful acting career in both film and television. He also starred or co-starred in the films Tommy Boy, Black Sheep, Joe Dirt, Joe Dirt 2: Beautiful Loser, Grown Ups, and Grown Ups 2, among others. Christopher Nash Elliott is an American actor, comedian, and writer. He is best known for his comedic sketches on Late Night with David Letterman, starring in the comedy series Get a Life on Fox TV and Eagleheart on Adult Swim, as well as his recurring roles as Peter MacDougall on Everybody Loves Raymond and as Mickey Aldrin on How I Met Your Mother. He has also starred in the films Cabin Boy, There's Something About Mary, Scary Movie 2, and Groundhog Day. He is currently starring as Roland Schitt on CBC Television's Schitt's Creek. Another noteworthy presidential portrayal was that of Dan Aykroyd as former president Nixon from 1975–79. 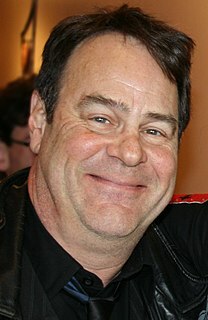 Daniel Edward Aykroyd,, is a Canadian-American actor, comedian, musician and filmmaker who was an original member of the "Not Ready for Prime Time Players" on Saturday Night Live (1975–1979). A musical sketch he performed with John Belushi on SNL, the Blues Brothers, turned into an actual performing band and then the 1980 film The Blues Brothers. The web short Presidential Reunion , released in 2010 and produced by Funny or Die, reunites six SNL cast members who have portrayed sitting presidents. The cast members span all the sitting presidents that have been portrayed on SNL up to 2010 with the exception of Ronald Reagan. Jim Carrey portrayed Ronald Reagan in the web short because two of the actors who had portrayed Reagan had died, and the remaining three had declined to appear in the reunion. Although he was never a cast member for SNL, Carrey did audition to be a cast member for the 1980–81 season and has hosted the show in May 1996, January 2011, and October 2014. Donald Trump, having been a public figure before being president, was portrayed by several cast members over the years. He was portrayed by Phil Hartman (1988–90), Darrell Hammond (1999–11, 2015–16), Jason Sudeikis (2012) and Taran Killam (2015). The Primetime Emmy Awards are presented by the American Academy of Television Arts & Sciences. These are the cast members who won or were nominated for an Emmy for their work while in the cast. 34 former SNL cast members have come back to host the show. The first former cast member to come back and host the show was Chevy Chase in February 1978, and the most recent former cast member to join the list was Seth Meyers, who joined in October 2018. Three cast members are part of the Five-Timers Club: Chevy Chase, Tina Fey, and Bill Murray. John Belushi 33 March 5, 1982 Belushi died of a drug overdose from a speedball injection (cocaine and heroin). His death led to the conviction of Cathy Smith for administering the fatal injection. Gilda Radner 42 May 20, 1989 Radner died from ovarian cancer. She was originally scheduled to host the season 13 finale, a first for a former female cast member. However, SNL was canceled due to a Writer's Guild of America (WGA) strike. Radner's health worsened the following year. Moments before the season 14 finale, news broke of Radner's death. In lieu of the opening monologue Steve Martin, visibly shaken, introduced a replay of the "Dancing in the Dark" sketch he and Radner had performed in a 1978 episode;  her ex-husband G. E. Smith performed a musical tribute to Radner with the SNL Band. Danitra Vance 40 August 21, 1994 Vance died of breast cancer, which had returned after a remission three years earlier. Chris Farley 33 December 18, 1997 Similar to Belushi, Farley died of a drug overdose from a speedball. His death occurred less than two months after he came back to host SNL, which turned out to be his final television appearance. Phil Hartman 49 May 28, 1998 Hartman was murdered by his wife, Brynn, while he slept in his Encino, California, home. Before committing this crime, Brynn had allegedly consumed a combination of cocaine, alcohol, and the antidepressant drug Zoloft, and later killed herself. During SNL's 25th anniversary special in 1999, several of Hartman's peers honored his memory by replaying his sketch "Love is a Dream" from 1988. Charles Rocket 56 October 7, 2005 Rocket was found dead in his Canterbury, Connecticut, backyard. Local police concluded his death a suicide; Rocket had allegedly taken his own life by slashing his throat with a box cutter. Tom Davis 59 July 19, 2012 Davis died from head and neck cancer. Wikimedia Commons has media related to Not Ready For Prime Time Players . ↑ Alec Baldwin performed the impersonation on a recurring guest basis, and not as a member of the cast. Cornelius Crane "Chevy" Chase is an American comedian, actor and writer. Darrell Clayton Hammond is an American actor, stand-up comedian and impressionist. He was a regular cast member on Saturday Night Live from 1995 to 2009. Saturday Night Live is an American sketch comedy series created and produced by Lorne Michaels for most of the show's run. The show has aired on NBC since 1975. "Live from New York, it's Saturday Night!" is a famous phrase typically featured on the American sketch comedy show Saturday Night Live, which runs on the NBC broadcast network. It is generally used as a way to end a cold opening sketch and lead into the opening titles/montage and cast introductions for the program. The twelfth season of Saturday Night Live, an American sketch comedy series, originally aired in the United States on NBC between October 11, 1986 and May 23, 1987. 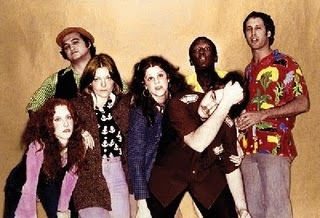 The second season of Saturday Night Live, an American sketch comedy series, originally aired in the United States on NBC from September 18, 1976 to May 21, 1977. The thirty-fifth season of Saturday Night Live, an American sketch comedy series, originally aired in the United States on NBC between September 26, 2009, and May 15, 2010. Presidential Reunion is an American comedy Web short directed by Ron Howard and starring Saturday Night Live cast members who parodied Presidents Ford to Obama. The skit was released onto the Funny or Die website on March 3, 2010 and received mixed to negative reviews. The following is a list of recurring Saturday Night Live characters and sketches introduced between October 13, 1979, and May 24, 1980, the fifth season of SNL. 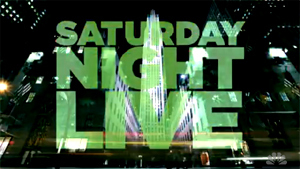 Saturday Night Live premiered its fortieth season during the 2014–15 television season on NBC. The season premiered on September 27, 2014, with host Chris Pratt and musical guest Ariana Grande and came to a conclusion on May 16, 2015 with host Louis C.K. and musical guest Rihanna. Former cast member Darrell Hammond succeeded Don Pardo, who had died in August, as the show's new announcer. The premiere included an interstitial photograph of Pardo – SNL's announcer since it premiered in 1975. 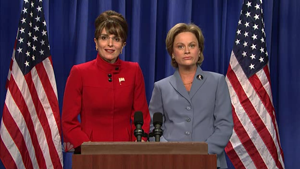 The sketch comedy television show Saturday Night Live (SNL) has for almost three decades aired a number of sketches parodying Hillary Clinton, from her time as First Lady, and during both her presidential campaigns in 2008 and 2016. This article is about the most recent history of Saturday Night Live from 2015 through 2019. 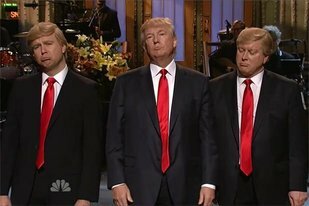 The sketch comedy television series Saturday Night Live (SNL) has parodied Donald Trump since 1988, from his time as a real estate broker, to his popular run as host of The Apprentice, and ultimately during his presidency. The 42nd President of the United States Bill Clinton has been parodied on Saturday Night Live (SNL) since 1992. Clinton was in office 1993-2001, and has been portrayed on the show over a hundred times, most often by Darrell Hammond. ↑ Graham, Mark. "The Michaela Watkins Club: 21 Other SNL Cast Members Who Only Lasted a Season (or Less) – Vulture". Nymag.com. Retrieved May 16, 2011. ↑ Specifically, 21 May 1977 Archived October 2, 2013, at the Wayback Machine , 19 November 1977 Archived October 2, 2013, at the Wayback Machine , 10 December 1977 Archived October 2, 2013, at the Wayback Machine , 22 April 1978 Archived October 2, 2013, at the Wayback Machine , and 10 October 1981 Archived October 2, 2013, at the Wayback Machine . ↑ "SNL Presidents". Movieline.com. Retrieved May 16, 2011. ↑ Fair, Vanity. "Kate McKinnon's Emmy Speech Abruptly Cut Off as She Thanks Hillary Clinton". Vanity Fair. ↑ "SNL Archives | Cast | Chevy Chase". SNL Archives. Retrieved April 10, 2019. ↑ "Is There A 'Saturday Night Live' Curse?". Archived from the original on October 20, 2013. ↑ Caroline Donnelly. "7 Tragic SNL Deaths". ↑ Robert Rorke. "9 'SNL' stars we lost too soon". ↑ "Saturday Night Live Transcripts, 77r: Steve Martin / The Blues Brothers, Dancing in the Dark". ↑ "Michael O'Donoghue Tribute". snltranscripts.jt.org. ↑ "SNL Transcripts: Miskel Spillman: 12/17/77: Least-Loved Bedtime Tale: The Soiled Kimono". snltranscripts.jt.org. ↑ Thomas, Mike (October 20, 2015). "The Laughs, Pathos, and Overwhelming Talent of Jan Hooks". Grantland. Retrieved January 8, 2016.